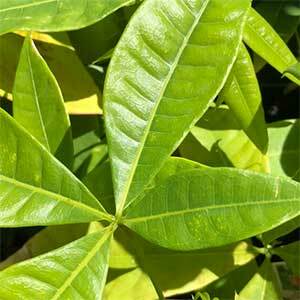 A fascinating tree commonly known as the Malabar Chestnut, the botanical name is Pachira aquatica. Although grown for the edible nuts, the tree is also grown as an ornamental plant. The nuts are usually roasted before eating and are said to taste a little like cashew nuts. They can also be ground and used a flour substitute. Grown in pots and containers indoors and said to bring good luck, as an indoor plant it is called the Lucky Money Tree. In these cases it naturally buttressed trunk is often trained carefully. Originally from Central America, this is really a tropical to sub tropical plant that grows in damp areas, it is however adaptable. The tree is often confused with Pachira glabra, which has white stamens on the flowers rather than red. The plants can be grown from seed if required. Cutting grown trees will fruit earlier, so this may be desirable to home gardeners. They are best grown in containers for first few years and kept in part shade especially over the first few summers. Regular watering and additional fertiliser will be required. Once established they can be planted out into the garden and again given a little extra care through the first summer. From seedling to nut production can take 5 – 6 years. Generally not required except for the removal of dead or damaged wood. As an indoor plant you need to grow the tree in a small container, this restricts the root system and encouraged the trunk to swell. In containers regular watering and fertilising will be required. The braided look is obtained by planting 3 or 4 seeds in the one container and plaiting the stems as they grow. Common Name – Malabar Chestnut, Guinea chestnut. Position – Full sun to part shade. Protect from very hot afternoon sun and hot winds. A frost free position is essential. Soil – Humus rich loamy soil is best, moist yet well drained. Clay soils are suitable and they will survive periodic water logging. Height – To 12 metres plus, usually smaller in cultivation. Spread – Forms a crown to 4 metres. Flowers – Red stamens, large with a nice fragrance. Fruits – Green outer casing with brown seeds or nuts inside.